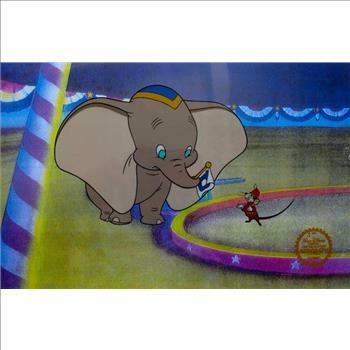 This is a GENUINE Original Limited Edition Serigraph Cel of DUMBO & TIMOTHY MOUSE from 1941 Walt Disney Studios - "DUMBO". 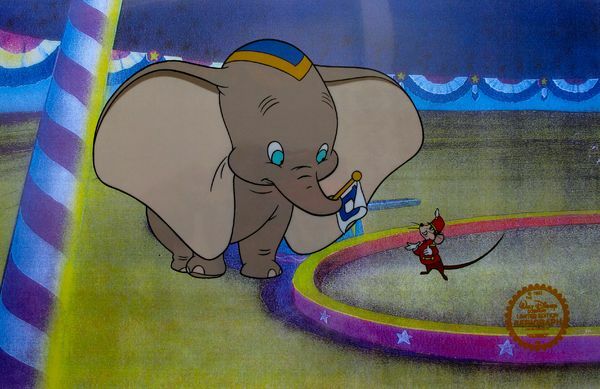 Disney’s own artists have selected this scene from the ORIGINAL animation drawings used to produce this classic Disney film. Known as a "cel", this image has been meticulously created as a Top Quality Serigraph for your Art Collecting pleasure! Walt Disney Official Emblem of Certificate of Authenticity is stamped at the bottom corner. Deluxe sericel itself measures approx. 11 x 14 inches, in full color. Includes a Complimentary Laser Background for framing. In mint condition.